Travel in luxury from Zurich to Amsterdam on this 12-day cruise.Take in the highlights of the Rhine & Switzerland including Lucerne, Montreux & Strasbourg. Though an integral part of the history of the region, Switzerland has always existed slightly apart from the rest of Europe, fiercely cherishing its independence and neutrality. You’ll get the opportunity to discover this beautiful land for yourself, visiting Zurich and Lucerne with Lake Geneva and the Swiss Alps serving as majestic backdrops. And that’s just the beginning. From Switzerland, begin your all-inclusive cruise through the heart of Germany. 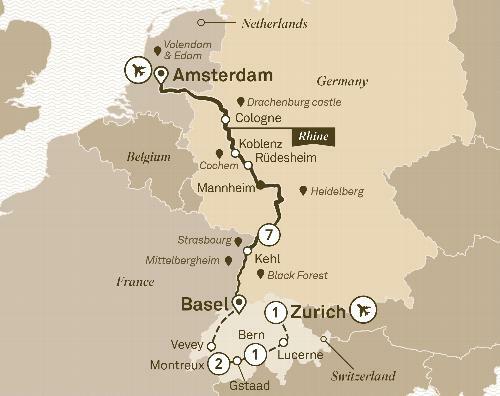 Take in Strasbourg, explore Heidelberg Castle, visit Koblenz and venture on to the port city of Amsterdam.